To help YWAM and other missions by building and serving in much needed facilities in different parts of the world, to allow the leaders of the mission to implement the world by training and sending out missionaries. The PA missions builders is located in Lancaster, Pennsylvania. 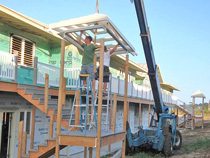 We have made possible many significant projects of construction through financing and sending out experienced work teams to communities in need. To coordinate construction, medical, and evangelistic teams for both short and long term missions to make a difference for those in need all around the world. "To prepare God's people for works of service, so that the body of Christ may be built up until we all reach unity in the faith and in the knowledge of the Son of God and become mature, attaining to the whole measure of the fullness of Christ."